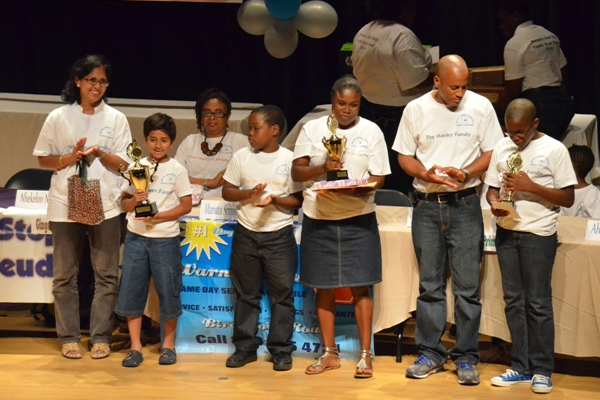 NIA Charlestown Nevis — The Srinivasan Family of the Montessori Academy are the winners of the 5th annual Warner’s One Stop Book Feud and captured the coveted title from a field of nine contestants. The Walters Family of the Elizabeth Pemberton Primary School came second and the Hanley Family of the Charlestown Secondary School placed third. The event was held at the Nevis Performing Arts Centre (NEPAC) on May 17, 2014, under the theme “Advancing Education by Fostering a Culture of Collaboration.” The collaborative event was staged by the Nevis School Librarians and the Ministry and Department of Education with main sponsors Warner’s One Stop and the Nevis Association of South Florida. In brief remarks before declaring the contest open, Permanent Secretary in the Premier’s Ministry Wakely Daniel, who spoke on behalf of Premier of Nevis and Minister of Education Hon. Vance Amory who was overseas on official business, addressed the issue of reading among the island’s youth and described the theme as appropriate and timely. “It captures the very essence of this event which is to create a culture of reading by bringing families together. Today we are living in a satellite era. The era of browsing the Net, playing with our mobile smartphones and watching television. As such, reading habits have taken a beating. “Our lifestyle too, has also proven to be another reason for the decline in reading. Tough and intense competition, seeking a job, long hours at work and our preoccupation with keeping up with the Jones has confined reading to the back burner,” he said. Notwithstanding, the Permanent Secretary noted, in the circumstances it was up to adults to ensure that children were exposed to reading. “It is left up to us, the adults, to promote or inculcate a reading culture into our children. Reading must not be confined to text books but they must also engage in creative leisurely and pleasurable reading – novels, newspapers, magazines. All will enable them to acquire more knowledge and help to keep themselves abreast of developments around the world. “It will make them employable and after completing school, of course, they will be able to get a job much easier,” he said. Daniel described the reading event as one which provided hope. “Family Book Feud inspires and gives us hope. It demonstrates to us that, with a collaborative effort, wonders may occur and a child’s personal and individual relationship with a book can stimulate their intellectual growth,” he said. Meantime, Vice President of the Nevis Association of South Florida Avonelle Hanley, in brief remarks, registered the organisation’s commitment to continue to contribute to the Family Book Feud. “The Nevis Association of South Florida takes great pride and joy in partnering with the Department of Education and in doing so we really and truly congratulate you on yet another anniversary of the Family Book Feud as you continue the development of Nevisian youth. As one of the principal sponsors of this most laudable event, we reaffirm our commitment and belief that a future prosperous Nevis has a direct correlation to how much we invest in our children today…We pledge to strengthen the partnership and the relationship between Nevisians here at home and those in the South Florida Diaspora. So as you celebrate this evening’s proceedings, know that your success is our success,” she said. While she expressed gratitude to the organisers and participants of the book feud, Hanley noted that although the Nevis Association of South Florida was relatively young, with its limited resources it was in support of assisting in the development of young Nevisians. “We sincerely believe that every dollar that we invest in this endeavour is an investment toward a more educated and prosperous Nevis. The future of our island is directly related to the educational and the socio- economic development of our youth. “I am sure everybody will agree with that and so there is no better place to begin than a venue like this where the spirit of competition and the value of self-confidence becomes the frame work for the development of future success…We really enjoy helping the people of Nevis,” she said. Other participants in the Family Feud Contest were the Westerman Family from Charlestown Primary School, the Hobson/Liburd Family from the Maude Cross Preparatory School, the Lawrence/Brown Family from the Violet O. Jeffers Nicholls Primary School, the Matthew Family from the Ivor Walters Primary School, the Sweeney/Chapman Family from the St. Thomas Primary School and the Nisbett Family from the Gingerland Secondary School.